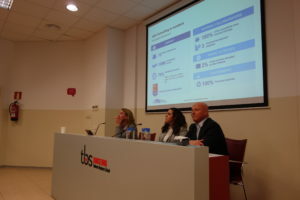 Yesterday, Alfa Consulting took part in a roundtable on CSR at the Toulouse Business School in Barcelona. 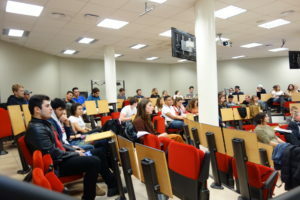 The discussion titled “Best practices in Corporate Social Responsibility” aimed to show the students the best way to manage social policies with win-win initiatives. 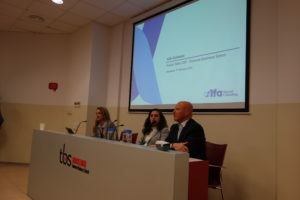 As in previous occasions, the event was organized by Cáritas Barcelona with the participation of two companies that shared their experience on CSR policies. The first company to showcase their initiatives was Hotel Arts. Sofía Kiguel, its Human Resources Supervisor, explained their program “Community Footprints” and talked about some of the efforts they do for “hunger&poverty relief” or “wellbeing of children”. Ignacio Guerra, CEO of Alfa Consulting, started his presentations by explaining what kind of consulting we do and who our clients are. He then stated that being a responsible company starts by “doing things right inside your company: fair salaries, career development programs, paying taxes…”. Only when that is covered should a company start other external initiatives. Guerra then outlined the different kind of activities Alfa Consulting does within their Alfa Solidaria program. 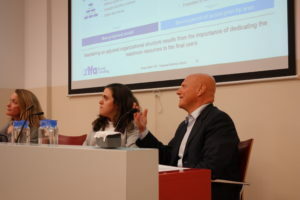 He lastly stated that being a social responsible company not only serves as a marketing tool, but also impacts employee engagement as well as recruiting new talent. Alfa Solidaria was created to develop our corporate value of involvement and solidarity more strongly. In the past 21 years, Alfa has collaborated with over nine NGOs and has allocated approximately 2% of the income to this program. You can click here to read more about other collaborations.